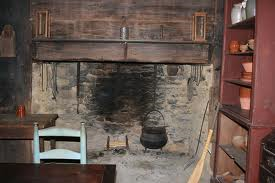 The utensils in colonial kitchens were made of brass, tin, pewter, wood or clay. The most affluent planters probably had an occasional boiler or copper and brass, imbedded in brick and mortar, and headed from beneath. The principal utensil for boiling was the great iron pot which was hung on moving iron racks firmly attached to the chimney-pierce. During summer, a large part of cooking was done out of doors.